While the broader U.S. stock market continues its melt-up off the deeply oversold conditions from late December, at this juncture, some stocks have more upside potential than others through the lens of risk versus reward. 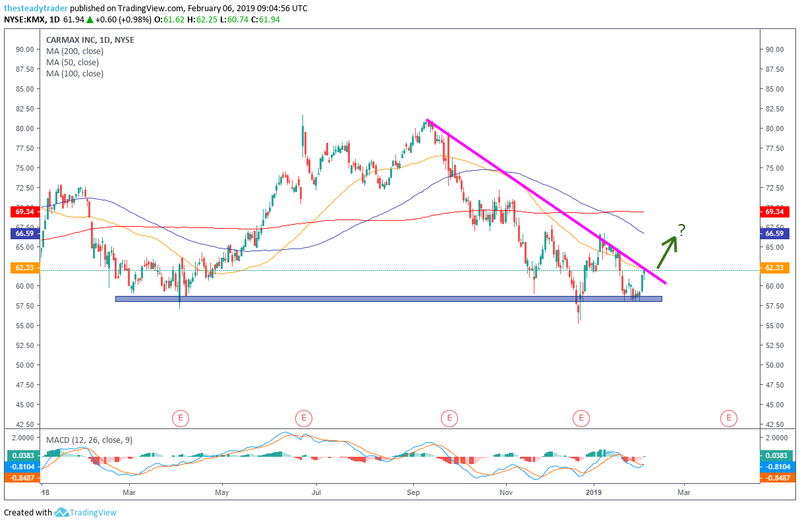 To wit, shares of CarMax (NYSE:KMX) have rallied very little since the December lows and, barring an immediate broader stock market reversal lower, now look good for more upside. Before looking at this trade setup in KMX stock, allow me to restate the importance of respecting the fact that the stock market is a highly correlated asset class. In other words, while sector and group rotation (money moving from one “type” of stocks to another) is how the stock market works, at near-to-intermediate-term turning points, most stocks will move in said new direction. So, while we are here today looking at a bullish trade idea in a stock, note that should the broader stock market reverse lower then this stock, too, will likely feel pain. On the multiyear weekly chart, KMX stock continues trading at the lower end of its longer-term up-trending range. It moved from the upper part of this range down to the lower end in the fourth quarter of 2018. The stock has since had a couple of attempts at a rally but hasn’t been able to get out of its own way. While this could be a warning sign, I am willing to look at this as an opportunity for a catch-up trade to the broader market rally. On the daily chart, we see that KMX stock has well-defined technical support around the $57 area (blue horizontal bar). Over the past couple of trading days, the stock managed to bounce off this area again and is now snug at its yellow 50-day moving average as well as the diagonal resistance line measured from the September highs. 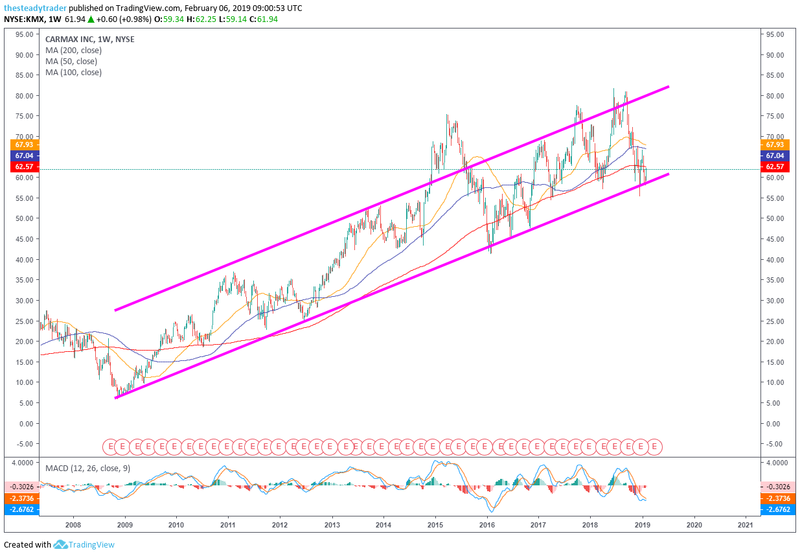 If one believes the the broader market has somewhat further near-term upside then buying KMX stock around $62 with a next upside target at $66 could make sense. Any major bearish reversal on a one-day closing basis and particularly any drop back below $57.50 would be a stop loss signal. In summary, while many stocks in my eye are currently very stretched on the upside, barring a new immediate-term bearish catalyst stocks could remain pushing somewhat higher and KMX stock is one idea. Again, any big bearish reversal in the broader market, however, would be a warning signal. The post Trade of the Day: CarMax Stock Is a Rally Catch-Up Trade appeared first on InvestorPlace.